Numbers: If you're a numbers person you are probably already naturally tracking something - like your budget, steps per day, or hours of sleep. Number’s tend to be pretty methodical and seems to prefer schedules and daily routines. For this person, giving them an initial calorie goal, an app to track and they are off and running. I can check in 2 weeks later, and they have recorded everything they ate and drank, while staying within goals. Plates: Telling a plate client to count calories is like telling them to go shovel sand off the beach…I usually have to promise that I will not make them record calories before they will even agree to sit down! If you’re a plate person you prefer flexibility over routine. You like variety within your meals and want a method that feels sustainable. The plate group wants to look at their meal and see a vegetable, a protein and a starch and feel like they are on track. Is there a method that can blend both groups? Yes - count food groups instead of calories. Based on your specific needs, I provide a suggested amount (usually a range) of servings to aim for, from each food group. See the example below. Now, here is the best part - you can track this in 60 seconds or less…! Once you have how many servings to aim for, you can tally each one on a piece of paper, a sticky note, or on a napkin for all I care! 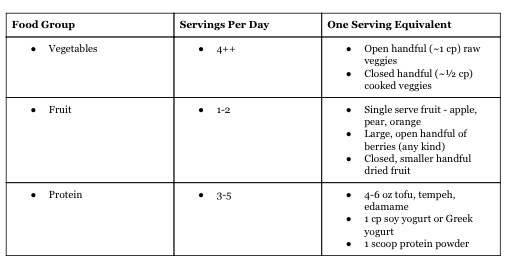 This shows that you have hit 2 of your 4 servings of veggies so far for the day, meaning that you now have (at least) 2 left - guiding you to think about how you will plan to get your remaining servings for the day. Make sense? What do my clients love about this approach? Well besides the fact that it is a form of counting calories, but in less time, it actually helps show what foods you still need to eat! You may start to see a pattern of foods you’re overeating, which could be sabotaging your efforts. I also feel like this is a more abundant approach to shifting eating patterns. So many people associate eating better with lack of food or having to give up types of foods. However, this 60 second approach focuses on filling your plate with healthier foods. A new year, a fresh start, a do over. After sleeping off the late night hangover and stumbling into the kitchen for a cup of coffee, we have flashbacks of the night before. My boyfriend and I had a house party with friends, we ate good food, played Catch Phrase, the ball dropped, we kissed and I thought, “this is gonna be a BIG year.” It was great. But the party is over and the dirty dishes are in the sink. I will get around to writing my hopes and dreams for the new year, after the house is clean, ok and maybe a movie and 3 hour nap. Can you relate? As modern day humans we already have SO much on our plate, and the thought of adding more goals can be just as exciting as it is overwhelming. I hope this post helps you get a little more clear on your resolutions and why you should, no need – to make them a priority. As a dietitian and health coach, clients and friends tell me their goal is to lose X number of pounds, or to fit in a size X before summer. Ok, that’s valid, but, aiming to become a healthier version of yourself will require you to dig a little deeper. Instead of focusing so heavily on the gravitational pull you have on Earth (or pounds on the scale) put your energy into the behavior changes that will help you get there. This way of thinking shifts the focus, and allows weight loss to be the byproduct of your other goals. So why do you want to lose X pounds? Please don’t say ‘to be healthier,’ this is the most vague and lame response imaginable. You are not vague or lame, don’t make you why either. It may be a step in the right direction, but let’s face it, it’s not going to get you out of bed 30 minutes earlier to fit in a morning workout! What will you have in your life that you don’t currently have right now at a lower body weight? Are you dying to have more energy? Trying to lower your cholesterol or blood sugars? Feel fewer aches and pains? Could your 2017 resolutions get a little SMART-er? The clearer you are about your goals, they clearer the path becomes for how you will get there.